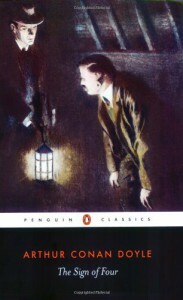 The second of Conan Doyle's four longer Sherlock Holmes stories and Holmes is called upon by a young lady who needs the great detective's help with a mystery regarding her missing father and pearls that keep arriving for her. And so the games afoot! well it is when there's a shady one-legged man involved and ill-gotten treasure from the east. Written in the same style as A Study In Scarlet of having the case revealed and then background story towards the end but it works much better in The Sign of Four, i think just for being a better story.